Marvin Brown takes his cooking seriously at Adat Shalom, where he serves a morning minyan meal. Longtime non-Jewish staffers help make their synagogues special. They are often the first to open up the building in the morning and the last ones to lock up at night. They work hard to make sure the furnace runs in the winter and the air conditioning is cool — but not too cold — in the summer. Because of them, the floors shine and the carpets are fresh right before the High Holidays and the start of Hebrew school. Their years connected to a congregation often outlast many Jewish members and even the clergy, making the synagogue or temple custodian not only the caretaker of our holy Jewish spaces, but a congregation’s unofficial historian. Many of Detroit’s synagogues and temples owe much gratitude to the dedication of their custodians, who take much joy in watching Jewish preschoolers grow into young men and women and return to synagogue with their own children. When they fall ill, they receive visits from congregation members and congregational clergy. For that, they say, working as a synagogue custodian is like being part of a big extended family. Murphy Ealy, 67, of Oak Park, worked in a scrap metal recycling facility when, in 1999, he got a call from an employment agency about a custodial position at Congregation Beth Ahm in West Bloomfield. His work at the recycling yard was “grimy.” Ealy loves to clean, so he said he was “strongly encouraged” to take on the new opportunity. 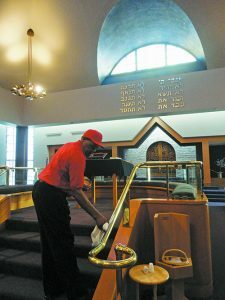 Seventeen years later, he still loves his job of preparing the building for services, meals and other programs throughout the Jewish calendar cycle. Murphy Ealy shines the brass on the bimah at Congregation Beth Ahm. Ealy arrives at Beth Ahm most days at 5:30 a.m. to open up the building for minyan. He then spends the rest of the morning cleaning and setting up for the week’s programs or services until his shift ends at noon. Many times, he will return to the building for evening functions and is especially instrumental during special occasions such as building the sukkah and helping the congregation’s sisterhood during its annual rummage sale. As Ealy polished the brass railings of the bimah in the sanctuary on a recent morning, he considered the holiness of his work. 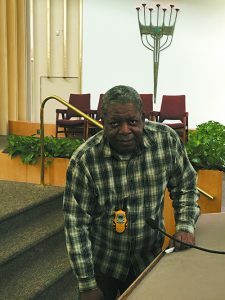 As keeper of the synagogue’s keys, a custodian is also on call for various emergency circumstances, like responding to an emergency alarm or a power outage. But it is not often that a custodian is called upon to determine the results of a local election. Beth Ahm serves as a polling location for Precincts 9 and 10 in Oakland County. One election night, Ealy returned home after work only to receive an urgent phone call from a local government official. The polling workers left the voting sheets in the locked synagogue, and they could not call the election until Ealy opened the building to count the votes. On the other side of town, Beth Shalom of Oak Park loves to brag about its “one-man maintenance team,” Vasile Havrisciuc. Vasile Havrisciuc, maintenance manager, spruces up the Beth Shalom sign. For 11 years, Romanian-born Havrisciuc has worked as the synagogue’s maintenance manager. He has a background in electrical, plumbing and HVAC skills and is “constantly finding ways to save the synagogue money,” according to building committee chair Allen Wolf of Bloomfield Township. Non-Jewish custodians of synagogues take on unique job responsibilities such as learning about Jewish laws and observances surrounding Shabbat, kashrut and other customs. According to Wolf, Havrisciuc is a devout Catholic who knows more about Judaism than most Jews do. “When Pesach comes around, no one needs to tell Vasile how to kasher the kitchen,” he said. “When the High Holidays approach, he knows how to re-arrange the shul and pull out the appropriate machzorim. On Shabbat, he knows we can’t turn on ovens or lights, so he makes sure these things are handled. Charles Criss, 57, of Detroit, has worked for Temple Emanu-El for 34 years. From those decades of experience comes the knack for anticipating the needs of the synagogue’s day-to-day operations, according to Executive Director Fredrick Frank. Criss said he has become an expert on the temple’s roof, forecasting where leaks may spring up and advising contractors during roof renovations. He knows the congregants just about as well as he knows the building. Like his counterparts working in other synagogues, he echoes that the best part of his job is watching the kids grow up over the years and coming back to temple with their own children. 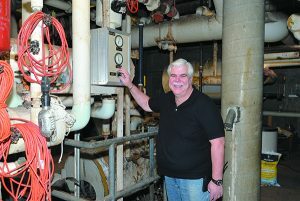 Charles Criss keeps Temple Emanu-El is in top shape. Rabbi Emeritus Joseph Klein would play an “informal” game with Criss each week, and each week, Criss would beat him at it. Though he cannot attend services at church as much as he would like — as the week’s busiest day is Sunday when Hebrew school is in session — over the years he said he received much “spiritual guidance” from the clergy and others at Temple Emanu-El. Marvin Brown of Southfield worked in the landscaping business when he got a call from Alan Yost, executive director of Adat Shalom in Farmington Hills, about a custodial position the day before Christmas Eve in 1984. After working for 33 years in a Jewish environment, words and phrases like shalosh seudos and mezuzah easily roll off his tongue. A cook at heart, a favorite part of Brown’s job is preparing meals, especially breakfast for morning minyan. Over his years at Adat Shalom, Brown said he has prepared the building for “thousands” of weddings and bar mitzvahs. During one bar mitzvah party, the synagogue lost power. Brown stepped in and saved the evening by walking back and forth to get diesel fuel at the Shell gas station on Northwestern Highway every hour or so to keep the backup generator running. 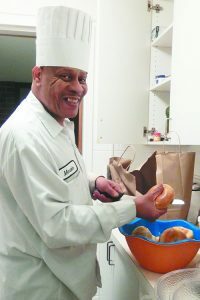 Marvin Brown is a cook at heart and loves preparing minyan breakfast at Adat Shalom. When Brown started his job, he did not know much about Judaism and the rules of keeping kosher. He didn’t realize that bringing in outside food — including ribs from his favorite barbecue place in Detroit — is completely forbidden. But now, as the primary food shopper for the synagogue, he knows how to select food with the correct kosher certifications and how to cook without mixing up the meat and dairy utensils in the synagogue’s kosher kitchen. Brown said he gets a decent amount of vacation time, including Christmas and Easter. And when Brown needed hospitalization in 2005, the nurses on his floor asked him if he was Jewish because of all the Jewish clergy who continually paid him visits. Brown was raised in a Baptist church. Though he says he does not get to church formally, he says the rabbis over the years like the late Rabbi Efry Spectre and the late Cantor Larry Vieder taught him that he can also “have church” right in the synagogue. Some synagogues are bigger than others and require a crew of maintenance staff to keep the building running. 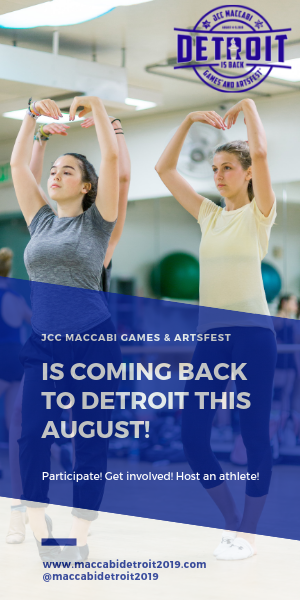 With 15,000 square feet of space and the ability to host 1,500 worshipers, Congregation Shaarey Zedek is one of the largest in the Detroit Metro area. The custodial staff, headed by Keith Armbruster, facilities director, keeps busy throughout the year by not only preparing the building on Shabbat and for special occasions, but also for large community functions that can host hundreds of people at a time. Armbruster, 60, of Livonia just celebrated his 40th anniversary last October working at CSZ. He says the unique architecture of the synagogue poses certain challenges, such as using a catwalk 100 feet above the sanctuary to change the lightbulbs and carefully maintaining the one-of-a-kind lighting fixtures, woodwork and custom-made large wooden doors that adorn the building. Thankfully, he said, the soaring stained glass windows do not need cleaning. Over the years, he has most enjoyed meeting the many interesting and prominent members of the Detroit community who have been members of CSZ. A good day for him means receiving good feedback when a special occasion or function goes off without a hitch. Most of all, he has enjoyed learning about Jewish traditions and takes pride of the knowledge he has gained over the decades. “Custodian” is a great work to describe what this great individuals do! We trust them with the custody of our beloved synagogues and they pay us back 100 fold. Marvin Brown is as much a part of Adat Shalom as the revered Rabbi Spectre and Chazzan Vieder, and certainly a more important part that the pews, the walls, and any amount of artwork on the walls. 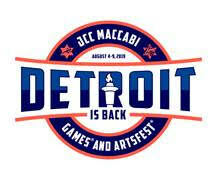 It is great to see Marvin and others recognized for their contributions to the Jewish community of Detroit! The gentlemen who were custodians at Adas Shalom on Curtis were just wonderful. It’s so long ago for me, I can only remember the name of Richard, but they were all great. I spent countless hours working on USY projects with only the custodians for company down in the social hall area. Years later, I was at the “new” Adat Shalom and saw Richard there. He didn’t remember me, but I told him how friendly and safe I felt when he was around. Nice guy.